If you notice warping, leaks or any other damage to your rain gutter system, call LGC Roofing, your NJ gutter repair contractor. 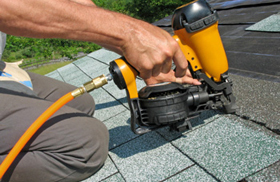 LGC Roofing is a leading gutters installer in New Jersey. We have been installing & repairing rain gutters for over two decades. We offer residential and commercial gutter installation and repair services on all forms of properties. We install 5 and 6 inch gutter; standard or half round. Don't worry, we will help you determine the the optimal gutter size for your home. We specialize in replacing aging gutters with new aluminum, vinyl or steel models, the best gutter solution available on the market today. 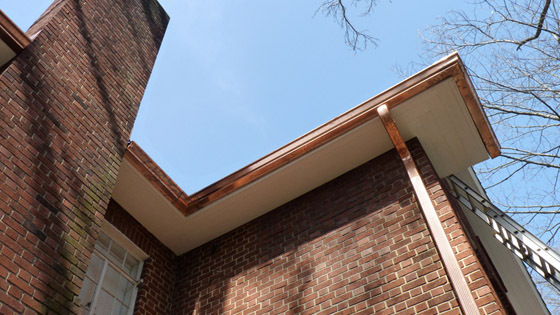 An additional benefit of many steel gutter replacement systems is a baked-on enamel coating which allows the gutter material to lasts for 30 to 40 years without requiring much maintenance—and you can choose enamel that matches your NJ home’s trim. Call LGC Roofing to schedule a thorough inspection of your home’s gutter and downspout system, or to inquire about gutter repair pricing. Clogging by leaves, twigs, ice or other debris - Gutter leaf guards offer no-clog guarantee. Improper pitching - Gutters need to be pitched downward at least ¼ inch for every ten feet of gutter length. 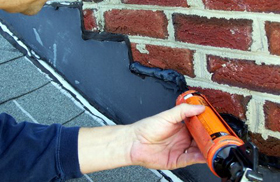 Leaky gutter joints - Gutter sealant needs to be applied to the inside of the gutter (patch for larger openings). Rain gutters protect your New Jersey home from leaks and moisture damage, so it’s critical that you handle any necessary repairs immediately. When gutters leak or downspouts back up, water may accumulate around your foundation. As moisture continues to seep into the foundation’s surrounding soil, walls and floors may settle or crack and eventually cause costly damage to your home. Maintaining gutter integrity begins with regular inspections which should be handled twice a year. Don’t wait until you’ve developed foundation problems to start thinking about gutter replacement or economical fixes. 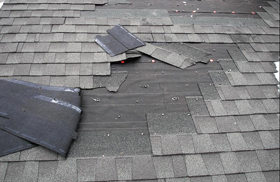 We are experts in gutter and roofing maintenance, offer competitive pricing and comprehensive guarantees. Request a rain gutters repair estimate for your home in just 20 seconds.